The best-selling artists in Motown history, Boyz II Men, are helping The Early Show in its search for the next great a cappella group. Viewers submitted videos of their a cappella groups in action, and the field has been whittled down to five finalists. Viewers got at a look at the final five Friday. 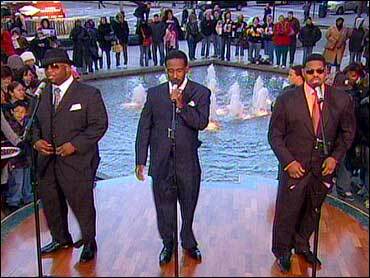 Boyz II Men will announce the winner on the show Monday. This six-member a cappella group hails from the New England area. The leader of the group, Nick, decided he wanted to keep singing after graduating from the University of Vermont, so he contacted a few other guys he knew from his college days. Some of the members know each other from college, others joined by answering ads on Craigslist. There are a few core members, and some guys who float in and out. The group generally meets once a week for about three hours to rehearse and work on new material. Someone usually brings a new arrangement, and they work on it until they get it right. Most of the guys are musically inclined: Some played instruments in high school and college, a few studied music in college, and everyone else does it just for fun. What these guys like most is the intimate interaction their a cappella performances generate with their audiences. It also builds a sense of camaraderie among the members. Over the summer, they made a conscious effort to bring a cappella music to the streets of New England. So they traveled up the coast and performed for crowds gathered at street fairs and community festivals. Their main goal was to expose a cappella singing to people who may not have heard it before. They say they were really pleased with the positive response they got. One interesting thing about their group is that they don't pigeonhole any of their members to one style of singing. So, the guy who sings the bass line on one song might sing the melody on another. In most a cappella groups, the guys are stuck in one role in all songs. This four-member group is based in Menlo Park, Calif. They've been singing together for about seven years. Two of the guys sang together in college, and they originally wanted to have a sextet. So they auditioned about 50 people, but were only able to find two more that really fit in. They had six in their group for about a week, then two quit, so they stayed with four. One guy does the beat-boxing and the bass line at the same time. He is one of only two people who do it in the country. They get together to rehearse once a week and usually spend two-to-three hours rehearsing. One of the members is now on the East Coast, so he is only able to practice with them about once a month. They've played a bunch of local gigs in the San Francisco area, in little clubs. They've also done birthdays and corporate events, and they even opened once for Kool And The Gang. Bud is married to the sister of a member of the group. They just got married three weeks ago. They're all a bunch of tech geeks and work in the computer software industry. This is another six-member a cappella group, from Henderson, Nev. They've been together for about three years now. They all lived in Orlando, Fla. together and liked to sing. Josh Huslig started the group with different people that he'd worked with musically. They all found that they had the same passion for singing and wanted to change people's perception of a cappella groups. They try to do a lot of private events, such as weddings and birthdays. And they really want to become the next big group. Word of mouth and networking have been very important to them. This six-member group is actually a splinter group from a 60-member a cappella chorus called Capitaland. The six women started singing together and working on their version of Queen's "Bohemian Rhapsody" about 18 months ago. They all met through Capitaland. Some have been part of that chorus for more than 20 years. They're the oldest a cappella group in the field of finalists. Most of the women are in their mid-to-upper-50s. Some are moms, and a couple are grandmothers. This group has six members, although one of the singers just gave birth. They started singing together about three years ago. On Call has officially been together for about a year now. This six-member a cappella group can not only sing, but they've got brains! They're all medical students at the University of Rochester Medical School of Medicine and Dentistry in upstate New York. Through word of mouth and an e-mail or two, they knew that they had been in singing groups before. Despite their intense work and study schedule, they still find a couple hours a week to rehearse -- in the student lounge of their med school! They've performed at a few university functions, and they also sing in the hospital around holiday time for the kids, hoping to lift spirits.